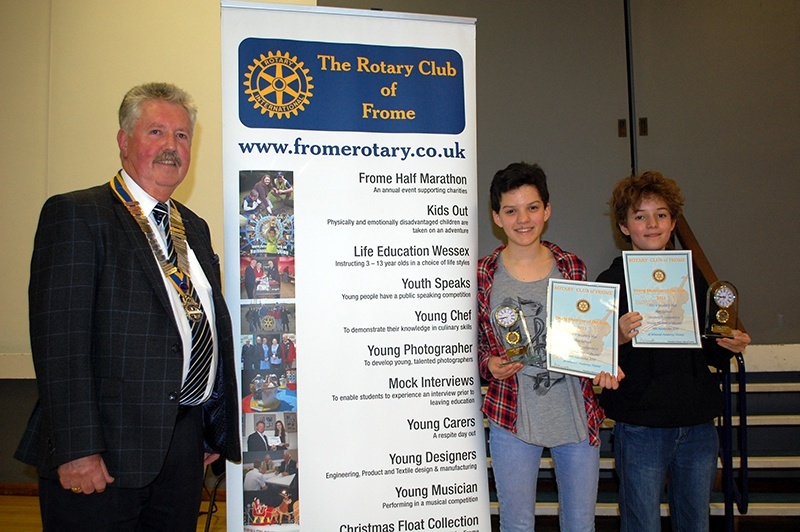 The Rotary Young musician Competition for 2015 was held at Frome Selwood Academy on Friday 13th November. There was a good attendance and a wonderful evening followed. Selwood Academy provided their supernumerary Music Master, knowledgeable and very amusing who must be an asset who represented the Head who was at another function. 12 children from 9 to 17 took part, from Writhlington School, Wells Cathedral School, St John’s First School, Frome Community College, St Lawrence School, All Hallows School, Bath College, and Selwood Academy. They sang, played trumpet, guitar, piano, violin, cello, and marimba. Lyndy and Kerry Bishop gave a detailed adjudication of each pupil and awarded first prize to Eliza Talman aged 14 and Stan Talman aged 12 on the marimba, both from Wells Cathedral School. The evening was generously sponsored by Clarkson's Independant Funeral Directors thanks to Rotarian Wayne Kelly. One left encouraged to have heard such talented youngsters much encouraged by parents, teachers and others.